Club Penguin Cheats by Mimo777 Club Penguin Cheats by Mimo777: Club Penguin Puffle Rescue Sneak Peek! I Think when you save the Puffles, When you go into the UnderWater place, In the Secret Cave... That you go Up through the water to save some of the other puffles from the sharks. That looks like a matress quite far from the iggloo! Is there any possibility we will have to rescue Yarr in this mission? It seems like the ocean...? WAİTİE WAİTİE! WE R gonna use the "LİFE PRESERVER SHOOTER!" THATS how we saved the penguins from the iceberg that tipped! FİRST EPİSODE REMEMBER!? MİMO REPLY THİS!!! I can be your MOD! I can run theories! PLEEEEASE! Soon Enough you might make a good one! Slipping on Ice, and Waddling! 2) cant wait til monday!! Stop putting "CPG MOD" after your name when you arent modding!!!! You dont need to put "CPG MOD in traing" just put "CPG MOD" you will gain ranks faster! Ok, mimo, I think you need to post the mod rules again!!!! 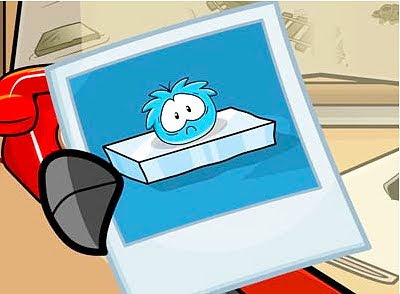 I think that the blue puffle is on a block of ice not a mattress. Is this game going to stick around, and not just still Yarr and the other puffles are found? thats not a matrss is a baby iceburg!!! IT IS NOT A MISSION-IT IS A NEW GAME. That's it. Me niether! Hope it's not members only. I think that's a pretty reasonable explaination. I thought it was ice too. It was a mission not an episode, usually mimo doesn't reply to comments and you surely can be a mod! Just answer questions then put (CPG Mod) next to your name. Mimo a lot of people are putting (CPG Mod) when not modding or if they aren't a mod, and people are asking to be a mod. Plus this has always been happening. People breaking the comment rules. mimo! guess what?! When you put your mouse over the migrator on the main page, Yarr pops out with a telescope. Maybe yarr was planning this mischeif all along! i dont think hes on a mattress - i think hes on an ice cube in the water. it would fit cos of the sharks. i think that you play a game where you save puffles, somehow related to when hamsters attack the game ( see Dav Pilkey's website and play the game if you don't get my point). that picture is in the news paper and in the background are rail road tracks with a mine cart plus the tentacles of the squid which means that it is underwater and i think we have to save the puffles from the giant squid as well! !